The Caribbean stretches out like a necklace from the coast of Venezuela in the South-East to the island of Cuba in the North-West. Almost all the islands are within sight of each other, which makes it easy to travel by boat, you would think, but unfortunately inter-island ferry connections are few and far between. 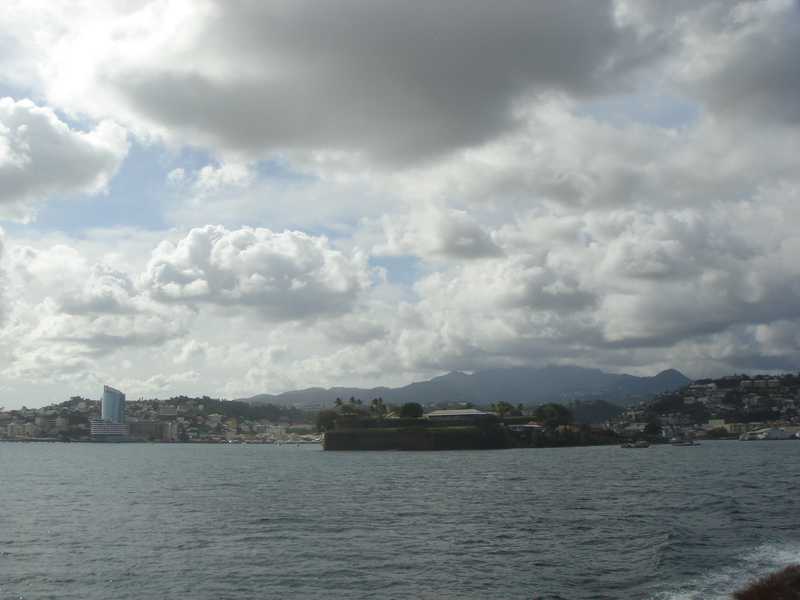 Leaving Fort-de-France on the fast ferry. We arrived in Castries, St Lucia, around 5.30 pm and were put in a long line to get through immigration. Travelling with an Indian passport always is adventurous in these kind of situations and this time was no different. Even though we had gone to the St Lucian consulate in Martinique and were told that Sujatha could get a visa on arrival, they had forgotten to mention one small detail. The ferry terminal doesn’t issue visas on arrival, period. Apparently, only the airport immigration staff was in possesion of the required stamp, so the solution was for a driver to come pick us up at the ferry, drive us over to the airport, where we could get the thing done. After some lenghty discussions between immigration staff, we were told to have a seat by which time the entire ferry terminal was empty and all the security guys were just waiting for us to be picked up. They were pretty relaxed about it though. After another fifteen minutes, the driver still didn’t show, and they came up with a different solution. They would hold on to the passport and send it to the airport the next morning, where we could pick it up when leaving the island. As it was getting quite late by now, it had been an hour and a half since we arrived, we agreed, hoping that they couldn’t lose a passport in a country of only two hundred thousand people. Less people, less bureaucracy. One of the security guys was friendly enough to hold back a taxi for us, and off we went into the St Lucian night. 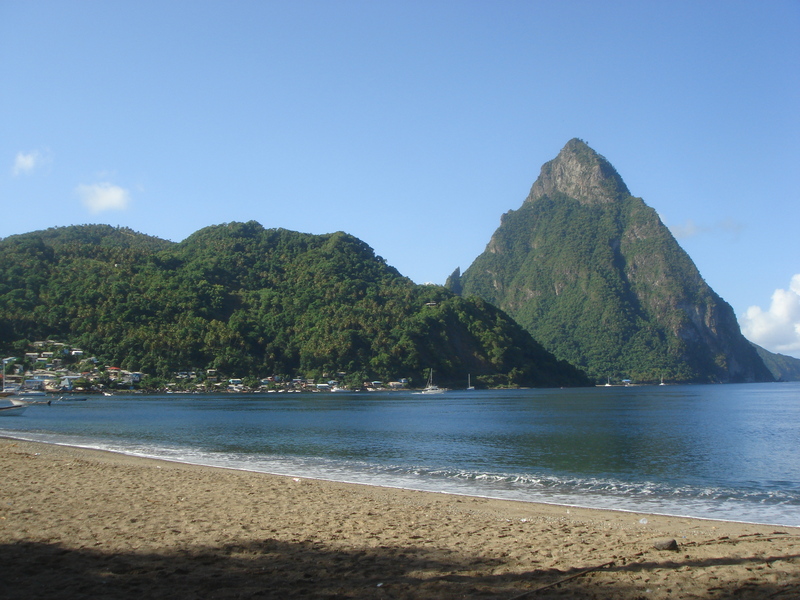 The thing to know about St Lucia is that it’s basically the top of a mountain range peaking out above the water. That means that the roads shoot up and down, curving through tropical forest and past chasms (which we couldn’t see in the dark), pretty much non-stop. A 26-mile ride takes about an hour. We made it to the Hummingbird Resort in Soufriere just in time to catch dinner service, and went to bed soon after. View of that most perfectly triangular mountain. Petit Piton. The next morning we woke up to a stunning sight. The resort, a collection of a dozen small bungalows and rooms, sat right on a sandy bay, and behind it rose the most perfect mountain you could imagine. Petit Piton. When you’re a child this is how you draw a mountain, a steep triangle rising sheer from the blue waters. We ended up spending four days there. The resort was quiet and comfortable, it being the off-season, and the village had a few small restaurants and a great little coffee-shop overlooking the church square. Contrary to the Hummingbird, which sits at the edge of the village, most of the large resorts are hidden away on the beaches, valleys and hilltops of the surrounding area. The bulk of tourists that come here, only venture outside on organised tours, and it leaves the villages feeling a little dead. There’s pockets of wealth on the island, but it isn’t spread very well and local shops and restaurants don’t really benefit. 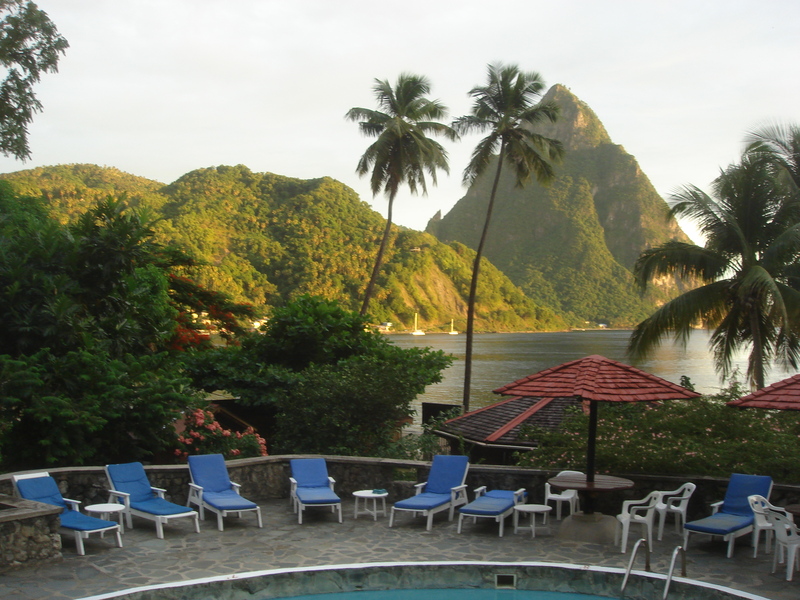 View from the pool at Hummingbird Resort, Soufriere. The weather report in the Caribbean at this time of year always includes an update on any storms building over the Atlantic and on our second to last night in Soufriere a Tropical Storm watch was initiated. 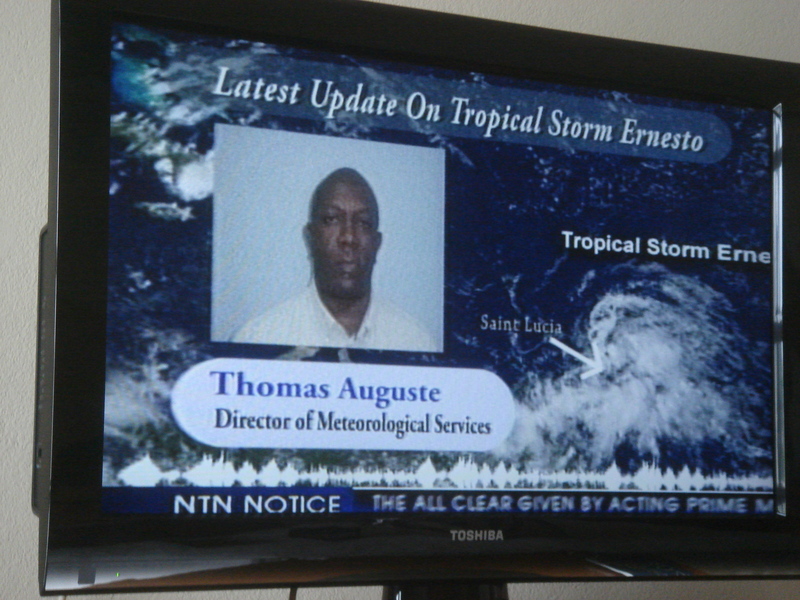 Ernesto, the first named storm of the season, was located some 900 kilometers to the south-east of St Lucia and moving towards the island at a rate of thirty kilometers an hour. The next day fishermen started to secure their boats, but apart from that preparation was minimal, as the storm wasn’t seen to be strengthening significantly. Ernesto hit around six the next morning. We woke up to strong gusts of wind and sheet rain falling all around for the next hour or so. After that the weather abated a little, but heavy showers fell every thirty minutes or so. 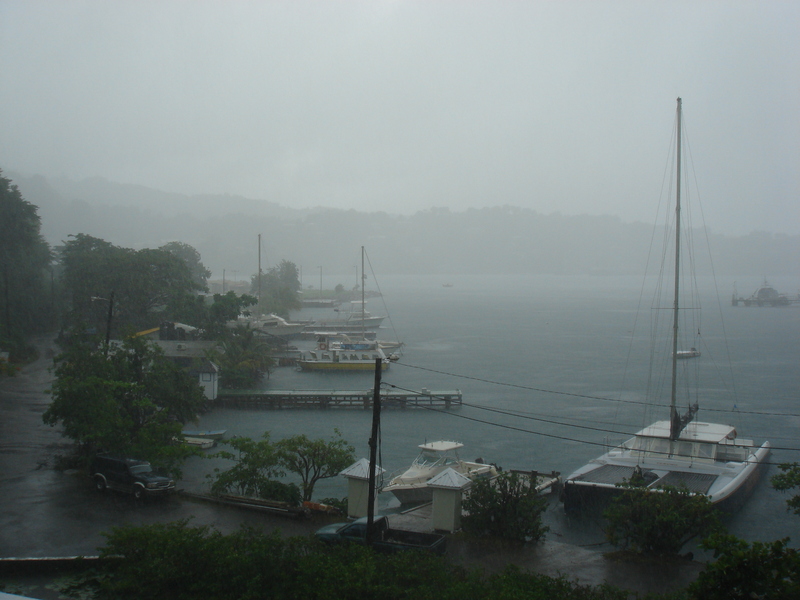 Ernesto rains down on the harbor in Castries, St Lucia. We took a taxi back to the capital late in the morning. The roads were covered with fallen branches and we could see the occassional upturned tree on the hillsides. It took us about an hour again to get back to Castries, this time in full view of the chasms. The prime minister had shut down the country for the morning, which meant that all shops, the docks and airport were closed, and the empty streets had an eerie feeling. At noon the all clear signal was given on TV, and we made our way to the airport to pick up Sujatha’s passport, which was lying already stamped at the immigration desk. The next morning, in between lashing rain, we went back to take a plane to St Vincent, as there is no ferry connection. Flight time, a massive eighteen minutes. The Prime Minister and the Director of the Metereological Institute give the all clear. Lovely post and pic of the Piton…it was a great spot and I’ll never forget the excitement of staying passport-less for a few days!